For all little princesses and princess-wannabes, the Disney cosmetics series presents Frozen. 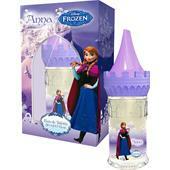 Sisters Anna and Elsa adorn these cute care products, which pamper little girls up into beautiful ladies. The products will thrill with both their fairytale appearance and also their amazing fragrance. The Elsa eau de toilette, for example, smells fruity and fresh, with notes of lemon, melon, apple, raspberry and bergamot and just a hint of green leaves. Magnolia, violet, roses and lily-of-the-valley build the middle note, whilst amber, vetiver and teak form the base note. The fragrance is light and carefree and is therefore the perfect match to the exuberance of young girls. The glittery Elsa and Anna roll-ons are also full of fantasy and fragrance. After all, what’s a princess without a bit of glamour? The sparkly cosmetics are easy to apply and can be removed just as easily later with a little soap and water. To make sure her hair is as shiny as a princess’s, the Disney Frozen range also includes a paddle hairbrush. The bristles glide smoothly through the hair, with no tangling or tearing. The round beaded ends of the bristles also serve to massage the scalp. 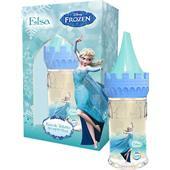 The magical cosmetic products in the Disney Frozen range will make daily care routine a real pleasure. And that will please not only little girls, but mum and dad too.